Fifteen years ago today, President Bill Clinton signed into law Executive Order 13166, “Improving Access to Services for Persons with Limited English Proficiency.” The order required federal agencies to ensure those who have difficulty speaking English could still access services provided by the federal government. 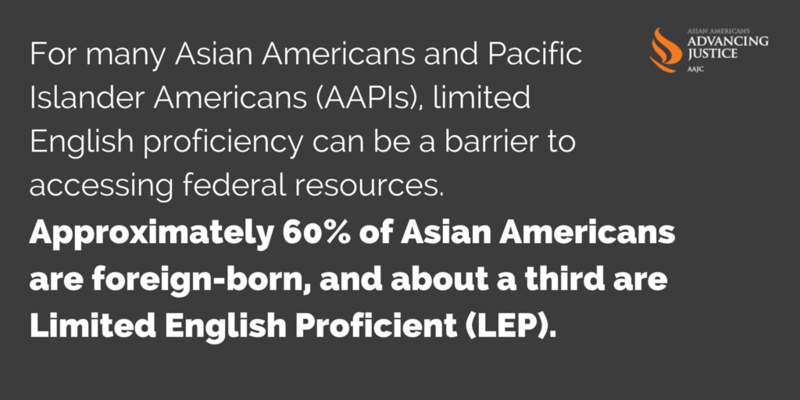 For many Asian Americans and Pacific Islander Americans (AAPIs), limited English proficiency can be a barrier to accessing federal resources. Approximately 60% of Asian Americans are foreign-born, and about a third are Limited English Proficient (LEP). E.O. 13166, in theory, made accessing federal services such as enrolling children in school and accessing healthcare easier for LEPs. But having measures on the books like E.O. 13166 are only as good as they are effectively implemented. Federal agencies can and must do more to serve AAPI communities. It’s not much different than what Advancing Justice | AAJC has said about the Section 203 and 208 of the Voting Rights Act, which guaranteed by law language assistance for LEPs at the polls. Even though the law is in effect, poll workers don’t know about it and they definitely don’t know how to abide by it on Election Day, infringing on the voting rights of many LEPs without even knowing it. For example, in 2003, Harris County, Texas failed to provide Vietnamese ballots on its voting machines, a full year after they were determined to have a population large enough to require in-language materials at the polls. When they made Vietnamese paper ballots as a quick fix for the problem, they didn’t make them available at all poll sites. We’ve seen similar problems happen in 2011 in California, and as recently as two years ago in New York City, when Queens County failed to provide language assistance for their large population of Asian Indians for four elections since the determination that they needed to make such information and services available. While we are grateful to have mechanisms like Sections 203 and 208 of the Voting Rights Act, we should not have to litigate violations of voting rights laws in order to see meaningful language access at the polls. The same holds true for E.0. 13166. As the Asian American population grows faster than any other racial group in the country, it’s more important than ever that federal agencies do what’s necessary to comply with the letter and the spirit of E.O. 13166. Identifying our communities and creating in-language resources are a good first step, but not enough. As we celebrate 15 years of E.O. 13166, we call on federal agencies to be proactive in making themselves accessible to those who don’t speak English well by hiring bilingual staff, providing interpreters and actively reaching out to LEP individuals to educate them about services and inform them that language assistance is available. Providing agency staff with training in cultural competence would also help to foster meaningful access for all segments of our community. To learn more about E.O. 13166, download the issue brief by the National Council of Asian Pacific Americans (NCAPA), released today.